I live in a rural part of Whitchurch Stouffville and this beauty is a regular on our quiet street. Seen him/her maybe 5 or 6 times now and hear it nearly every night. I drove right up next to it for this photo. Wow, great shot! Thank you for sending this to us! 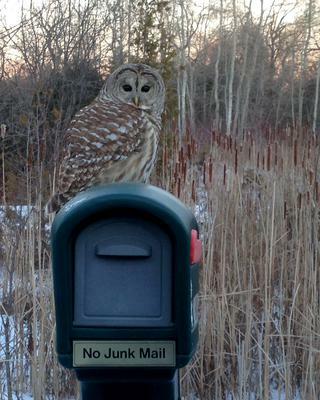 Readers can see more reports of Owl and other wildlife sightings on our Facebook page Discover Southern Ontario! This wonderful bird is actually a Barred Owl - the ones who call "who-cooks-for-you" (although I've learned we're not supposed to repeat it to them as it might challenge them in their territory (if they're nesting, etc.). They can actually sound like a band of wild monkeys at times, too. The call of a juvenile Barred Owl is incredibly unusual & doesn't sound like an owl. Our local Barred owl, that didn't seem that large, dispatched a large rabbit outside our rural back door not long ago. They are certainly formidable hunters. Thanks for your picture. I loved seeing one during the day!